This report focuses primarily on osteoarthritis — the most common type of arthritis — which affects 27 million Americans. Many people believe it’s a crippling and inevitable part of growing old. But things are changing. Treatments are better, and plenty of people age well without much arthritis. 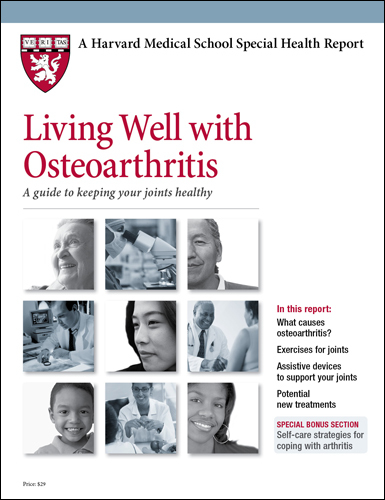 If you have osteoarthritis, you can take steps to protect your joints, reduce discomfort, and improve mobility — all of which are detailed in this Special Health Report, Living Well with Osteoarthritis: A guide to keeping your joints healthy. 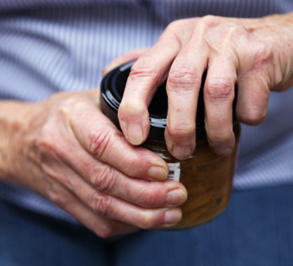 If you don't have osteoarthritis, the report offers strategies for preventing it. Arthritis can be distracting. Distressing. And disheartening. It can make you hesitant. It can frustrate — and even prevent — you from doing all the things you love to do. It is, quite literally, a pain. The good news is that you can live — and live well — with osteoarthritis, the most common type of arthritis. You can get relief from its pain and its consequences. This Special Health Report from Harvard Medical School will show you how. You’ll discover advances that are making a real and lasting difference and strategies that are helping men and women reclaim mobility and banish agonizing joint pain. Don’t let arthritis pain get in your way! End the relentless aches and aggravation and start enjoying a more active and pain-free life once again! The report will brief you on breakthroughs in joint replacement surgery. You’ll learn about the role of physical therapy as well as complementary procedures. And because medications remain the first line of defense, the report examines the effectiveness, safety, and possible side effects of more than 40 medications used to treat arthritis and relieve its pain. A special section covers a host of things you can do on your own to make coping with osteoarthritis easier. You’ll be introduced to helpful tools, pain-relieving exercises, smart food and menu ideas, and more. There’s no reason to ache when you can act! Order your copy of Living Well with Osteoarthritis today! Even the healthiest people find it difficult to stick with an exercise regimen. But those with arthritis commonly discover that if they don’t exercise regularly, they’ll pay the price in pain, stiffness, and fatigue. Regular exercise not only helps maintain joint function, but also relieves stiffness and decreases pain and fatigue. Feeling tired may be partly the result of inflammation and medications, but it’s also caused by muscle weakness and poor stamina. If a muscle isn’t used, it can lose 3% of its function every day and 30% of its bulk in just a week. A recent review of numerouse studies asserts that both aerobic and muscle-strengthening exercises are safe and effective for people with chronic arthritis. Below are brief summaries of different forms of structured exercise programs (most of which are offered by local Arthritis Foundation chapters) and their potential benefits. Land-based programs. These include community-based group classes led by health or fitness professionals with specialized training in instructing people with arthritis. Examples include Fit and Strong!, a program targeted to older adults with osteoarthritis; the Arthritis Foundation’s Exercise Program (AFEP); and its Walk with Ease program. All include some combination of a warm-up routine and three standard exercise goals, plus specialized activities to enhance body awareness, balance, and coordination. Studies have found that people with arthritis in their hips, legs, and feet who took Fit and Strong! classes were able to exercise longer, felt more confident about their ability to exercise, and reported less joint stiffness compared with those in a control group. Many of the benefits lasted between six and 12 months. Those attending AFEP classes for eight weeks had less pain, stiffness, and fatigue, and these improvements persisted at least six months, as well. In one study, people who completed the Walk with Ease program (which also teaches participants about managing their disease) had more confidence, less depression, and less pain, compared with participants who attended classes focused on pain management. Water-based programs. Also known as aquatic or pool therapy, these group classes are done in water that’s nearly 90° F and feature a variety of exercises, including range-of-motion exercises and aerobics. According to one study, people who took the Arthritis Foundation Aquatic Program improved knee and hip flexibility, as well as strength and aerobic fitness. Other investigations suggest water exercise lessens pain and boosts physical functioning, and the benefits after the 12-week session were sustained for three months after the last class. Strength and resistance training. This form of exercise, which uses equipment such as weight machines, free weights, and resistance bands or tubing, strengthens not only muscles but also your bones and your cardiovascular system. Resistance training improves muscle strength, physical functioning, and pain. One Japanese study compared people with knee osteoarthritis who either took NSAIDs or did twice daily knee extension exercises to strengthen their quadriceps (the muscles on the front of the thigh). At the end of the eight-week study, both groups had less pain and stiffness, as well as improved functioning and quality of life. Tai chi. With origins in Chinese martial arts, this low-impact, slow-motion exercise also emphasizes breathing and mental focus. A number of small studies suggest tai chi helps people with different forms of arthritis, mainly by increasing flexibility and improving muscle strength in the lower body, as well as aiding gait and balance. The Arthritis Foundation, along with Dr. Paul Lam, a family physician and tai chi instructor, developed a standardized form of tai chi designed specifically for people with arthritis. Based on Sun-style tai chi, one of the discipline’s five major recognized styles, it includes agile steps and a high stance (meaning the legs bend only slightly). Yoga. Scant research has explored the benefits of yoga for people with arthritis. One study showed that people with knee osteoarthritis who took eight weeks of Iyengar yoga (a form of yoga that focuses on correct body alignment, and uses blocks, belts, and other props to assist in performing postures) had less pain and could function better at the end of the study. Another study of people with rheumatoid arthritis found benefits from participating in twice-weekly Iyengar sessions for six weeks — namely, less pain and depression and greater mobility. But both studies were quite small, and neither included a comparison group.